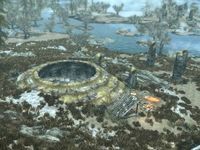 Ustengrav is a Nordic ruin northeast of Morthal containing Draugr, Warlocks, Bandits, Skeletons, and Frostbite Spiders. It contains two zones: Ustengrav and Ustengrav Depths. Bandits have occupied the ruins, and have set up a camp outside the entrance. However, warlocks have tried to occupy the ruin, resulting in lots of casualties between the rival groups. The ongoing battles have alerted the sleeping draugr, who have engaged with both groups. There are two bandits outside by the camp, and the corpses of two more can be found nearby—one by the campfire and one slightly north of the fire. When you first approach the campsite, the bandits will be attacked by a necromancer. The camp itself consists of two bedrolls (one under a lean-to shelter) and a woodpile with a woodcutter's axe nearby, a bucket, and a tankard on a rock. There are four deathbell plants growing alongside the rough path from the lake. Inside the barrow mound is another dead bandit, a chest, a few sacks, and a barrel with two bottles of skooma on it. There is a dead bandit to the right as you enter the ruin and a skeleton to the left with an iron weapon among the bones. There is another dead bandit near the bottom of the stairs. There is a dead bandit by the pillar in the middle of the room, and another at the far side; both are liable to be reanimated by the warlocks, depending on how the fight goes. If any of the warlocks survive, they stay and roam the area. If the bandit wins, they will head off deeper into the ruin. 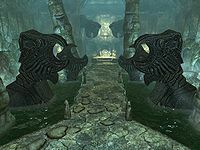 To the left of the entrance to the large chamber is a platform with a dead draugr, a potion of minor healing, and a random potion. In the area with the warlocks is a table and a chest. On the table is a potion of minor healing, a loaf of bread, a gourd, an iron sword, an iron dagger, and two random books. The path continues to the north of the table. Along the path are three dead warlocks and a draugr. The tunnel opens to a short corridor occupied by four draugr; another two warlocks have engaged in a fight with them. There is also a spellcaster trap to the left. In the first alcove to the right by the brazier are two potions of minor healing. Through the door to the left there are two rooms filled with urns, one to the west and one to the northeast. The western room contains six intact and one broken urns, a chest, and a potion of minor healing. In the broken urn are two additional potions. The northeastern room contains twelve intact urns, a chaurus egg (lying in a cast iron pot), a potion of minor healing, a potion of health, a draught of the healer, and a copy of the Restoration skill book Mystery of Talara, v 2. Continuing along the path there is a partially hidden staircase to the right just before the next large room. There is a table in the room down the stairs that holds a lot of loose gold coins, and an ancient Nord weapon of a random type. To the left is a partially hidden pull-chain. It reveals a secret passageway leading to a room with a chest. The last room consists of a narrow, two-level main chamber with an overlooking balcony. A draugr will burst from its sarcophagus as you enter, while another already patrols the far side of the room. 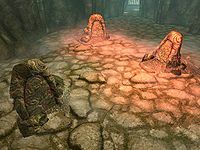 Another slumbering draugr is between the two active ones, and a dead one lies by the first alcove. There is an iron battleaxe by the middle alcove, and an iron helmet by the last one. The stairs up to the balcony are at the far end of the room, and there is a chest, two potions of minor healing, and a random potion. A stone bridge leads to the door to Ustengrav Depths. In the corner before the door is a petty soul gem, and there is a coin purse by the door. As you descend the stairs into the depths of Ustengrav, there is a hole in the wall to the right providing a view of the main chamber, and there is an iron sword on the floor by it. Further down the stairs, where the wall opens up to reveal another view of the main chamber, is a patrolling draugr. An ancient Nord bow lies near a lantern and a spent brazier. Over the wall that the lantern sits upon is a leveled shield. Take precaution, as it is somewhat difficult to get back if you choose to retrieve it. This is a good spot to ambush the skeletons that patrol the main chamber with some long-range attacks. Down the left-side stairs is an iron ore vein on the southwest wall. The path forward is to the left of that, but it is booby-trapped. There are four pressure plates, two of which are flame spout traps. It can be safely passed by staying to the left, as only the two right-hand plates are traps. Further along, the path is blocked by some rubble. The path forward is to the left (to the east) where the tunnel opens up to a stone bridge over a feasting hall. Two draugr patrol the area, one in the main area and another on another stone bridge on the other side of the room. Across the bridge there are some stairs running in a rough circle leading down to the level below. There is nothing between the dead draugr and the exit to the room. There is a table to the right of the lower entrance, five stone tables along the left-hand side of the platform, two to the right in front of a throne, and one more on the other side of the platform. Along with some food, there is a sample of charred skeever hide, a branch of lavender, some jazbay grapes, and a purple mountain flower on the five tables. There are some more food items on the tables by the throne, and a sheaf of wheat on the far table. It is entirely possible to avoid the first draugr here. There is a room to the east the length of the main room, with doors on either side. There is a chest and two potions of minor healing in the room. Once the other bridge has been crossed the path returns to the tunnel. The next room looks rather bare, but to the left is a small room. The entrance is blocked by two gates, which are raised by two separate handles. One handle is beside the gates, but the other is beside a sarcophagus to the west of the gates. 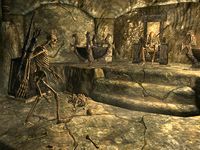 Upon approaching the sarcophagus a draugr will awaken; another wakens from another sarcophagus to the north, there is also a third dead draugr that is by the third sarcophagus that can be looted. There is an oil slick between the sarcophagi that can be utilized to deal damage to the draugr. The small room contains an arcane enchanter, a random dagger, a chest, a potion of healing, an empty soul gem, and a random potion. Through the tunnel to the west and up the stairs to the left is a table with a poison. The path continues north from here. The tunnel opens up to the main chamber. There is a stone path heading left that has collapsed and leads down to the main room. Three skeletons patrol this open chamber and another two patrol a walkway along the south and west walls. There is one last skeleton sitting in the throne in the northwest corner; it will awaken if it detects any non-skeletons. There are pillars either side of the throne, each with a random potion. The stairs to the walkway are to the left of the entrance (in the southwest corner) and at the top is a fire spout trap. A dead draugr lies across the trap, leaving it in a state of perpetual activeness. There are seven tiles and the safe path is straight through the middle. After this, along the wall to the left and behind some rubble, is a chest. Farther along is a small alcove to the left with a petty soul gem, a garnet, and a flawless garnet. At the end of the walkway you can see a chest blocked off by some rubble; there is an unorthodox way to get to it. By the first stone pillar there are a series of pillars that were once connected and leading across the chamber, but the walkways between them have collapsed. The key to accessing the blocked chamber is the shout Whirlwind Sprint. The broken parts still point to each other, and careful use of the shout allows the gaps to be crossed. The chamber contains a chest, a dead draugr and a lesser soul gem. Just to the left of the bottom of the entrance pillar, there is a dirt path along the wall that leads to a corundum ore vein. It is impossible to return up the path. At the bottom and to the left is a well-lit alcove. There are two potions—a random potion and a potion of minor healing—and chest there. 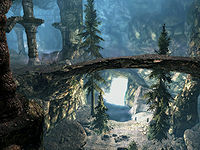 To the northeast is another corundum ore vein on the same level, and from the alcove, along some descending platforms and past a dead draugr is a silver ore vein (there is also another dead draugr after the vein). By now the word wall to the east should be clearly visible. Before that though, there is a secret room behind the waterfall. The small treasure room contains a chest, a random sword, and is guarded by a slumbering draugr. The word wall holds a word for the shout Become Ethereal. There is a dirt path behind the word wall that circles back up to the throne chamber. The bridge to the east leads to the final part of the large main chamber. Three stone posts stand in a triangle with a series of closed gates straight ahead. A skeleton patrols a walkway above and to the right. There is also two burial urns and a potion of minor healing up there. To the left of the stones lies a dead draugr and a potion of minor magicka amid some rubble. This puzzle requires speed to solve, literally. Each stone activates one of the three gates blocking the path ahead, but on a timer. It is impossible to sprint through the stones and the gates. The shout Whirlwind Sprint needs to be used, but only once you have sprinted through all three stones. Between the first two gates are pull chains to open the preceding gates. At the top of the stairs is a room with the entire floor covered in flame spout traps; there are also two frostbite spiders in the room. None of the pressure plates on the raised section work, and the clear path is straight ahead, then over the rubble. The clear path into the next room is to the left, directly towards a small set of steps. This next room contains two frostbite spiders and a giant frostbite spider that drops from the ceiling. There are also three spider egg sacs, and exit is blocked by two thick spider webs. There is an inaccessible ledge above the exit. A short tunnel then leads to a closed gate. A pull-chain to the left activates it, and there is another to the right on the other side to close it. Passing the pillars activates four large stone statues to emerge from the water on either side of the room. This is the resting place of Jurgen Windcaller. There are two burial urns in front of the coffin, and a mysterious note in the stone hand at the top of the coffin. There is a single sarcophagus either side of the coffin, with a dead draugr lying outside each. Behind the coffin is an urn and a door. Through the door is a room filled with six more urns, two burial urns, a chest, and a lot of loose gold by the chest. To the left is a tunnel leading to a door back to Ustengrav. Further up the tunnel a lever opens a secret door to the western urn room found shortly after the main chamber. The way deeper into the dungeon, and to Ustengrav Depths, will not be open until The Horn of Jurgen Windcaller has been started. If accessed prior to this, mages and bandits will be engaged in battle in the first main chamber, the exit to which is blocked. A leveled spell tome can be found in a chest in the room behind Jurgen Windcaller's tomb. The word wall teaches the Become Ethereal shout. Ustengrav is the burial place of Jurgen Windcaller. If you return to Jurgen Windcaller's coffin after completing The Horn of Jurgen Windcaller, you can activate it to release a dragon soul. When passing through the stone posts puzzle, it is possible to use the Whirlwind Sprint shout twice in a row, in quick succession. The frostbite spiders in the room before the giant frostbite spider may get stuck in the walls. Disturbing the desiccated corpse on the ledge to the right will make them emerge. The three puzzle gates in Ustengrav Depths are supposed to stay open once you have sprinted through, but may not. Waiting an hour once through the gates will teleport followers to your side. You can get through using the tcl console command, but this doesn't help followers. There are pull chains that can be activated on the other side of two of the gates. You can also, through the console, use their ref ID and the moveto player command to move your follower to your location, should they get stuck on the other side. This page was last modified on 16 April 2019, at 01:34.